30 MINUTES TO JUMP HIGHER AND SOAR WITH THE BEST. Become an all star cheerleader, nail your scorpion and take your toe touch to new heights. Use your Stunt Strap, Kbands, and our Jump30 Training Program to enhance your skills all in 30 minutes. Build hip strength and kick height with every movement to beat the competition. Don't wait. Get started today and see results now. ORDER NOW and receive a Stunt Strap for FREE! Improve range of motion and flexiblity. 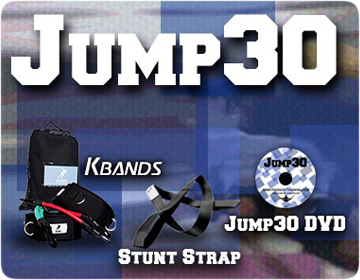 Jump30 includes training with Kbands Leg Resistance Bands, Flexibility Stunt Strap and our Jump30 Training DVD. Build your skills today with this great package. If you already have kbands select that in your product options and receive just the training program. Build leg and hip strength. Our Jump30 Training Program includes everything you need to increase your jumps. The first segment will focus on jump training techniques that have been proven to increase your jump height. Next, you will move through stunt specific jumps with the Kbands to increase strength and kick height with resistance during full range of motion. To wrap up the workout you will finish with a full Stunt Strap stretch routine that will increase your flexibility in your hamstrings, quads, groin, hips and lower back.